This day, I posted about opening of a new Railway Station – ‘Mundakakani Amman Koil’ Station in Chennai MRTS. Shosholoza Meyl is a division of the Passenger Rail Agency of South Africa (PRASA) that operates long-distance (intercity)passenger rail services. It operates various train routes across South Africa, carrying approximately 4 million passengers annually. Shosholoza is the name of a popular South African song about workers on a train and it therefore means moving forward. Meyl is a word that is related to a South African word for "long distance train", in August 2010, Shosholoza Meyl suspended services claiming either contract difficulties or unreliable trains. One of the routes it operated was : Johannesburg – Pietermaritzburg – Durban…. Johannesburg is the largest city in South Africa, by population. It is the provincial capital of Gauteng, the wealthiest province in South Africa; but is not one of South Africa's three capital cities despite being the seat of the Constitutional Court. Durban is the largest city in the South African province of KwaZulu-Natal and …………. ‘Pietermaritzburg’ is the capital and second largest city in the province of KwaZulu-Natal. It was founded in 1838 – its purist Zulu name is umGungundlovu. This is popularly translated from the Zulu as "Place of the Elephant", although it could also be translated to mean "The elephant wins". According to history, the city was originally founded by the Voortrekkers, following the defeat of Dingane at the Battle of Blood River, and was the capital of the short-lived Boer republic, Natalia. Britain took over Pietermaritzburg in 1843 and it became the seat of the Natal Colony's administration. More important piece of history would have that during apartheid, the city was segregated into various sections. 90% of the Indian population was moved to the suburb of Northdale while most of its Zulu inhabitants were moved to the neighbouring township of Edendale. Pietermaritzburg is to be remembered for the incident that changed the lives of many ….the one that occurred early in the life of Mahatma Gandhi. On 7 June 1893, while Gandhi was on his way to Pretoria, a white man objected to Gandhi's presence in a first-class carriage, and he was ordered to move to the van compartment at the end of the train. Gandhi, who had a first-class ticket, refused, and was thrown of the train at Pietermaritzburg. Shivering through the winter night in the waiting room of the station, Gandhi made the momentous decision to stay on in South Africa and fight the racial discrimination against Indians there. 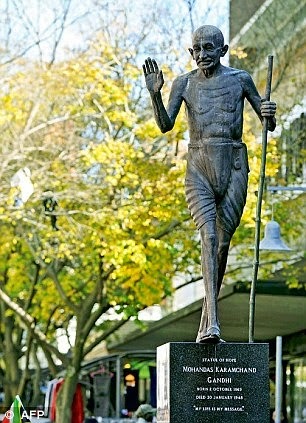 The statue that now stands in Pietermaritzburg's city centre would sure evoke memories of Mahatma Gandhi and his struggle against apartheid. It was after this incident that the barrister got wedded to the public cause of equality and freedom and experimented with various forms of protests against the white regime of South Africa. A report about a year back in Daily Mail reported that though the plaque is still there, the station doesn't ply passenger trains anymore. The station isn't even part of the tourist destination of the province. For locals, this is a history not-so relevant and is buried deep in the recesses of their collective memory, probably overrun by the towering presence of their leader Nelson Mandela. City Oval is a multi-purpose stadium in Pietermaritzburg and India played one of the Pool A matches in the ICC World Cup on 23rd Feb 2003…. India won by 181 runs – the opponent was Namibia – centuries of Sachin Tendulkar and Sourav Ganguly would be remembered though not much of its history by cricket fans. In that match Indians made 311 for 2 in the allotted 50 overs. Sachin made 152; Captain Ganguly remained unbeaten on 112. Namibia was all out for 130. Yuvraj had figures of 4.3-2-6-4. Namibia, is in southern Africa and has Angola, Zambia, Botswana as its neighbours. It remained a German colony until the end of World War I. In 1920, the League of Nations mandated the country to South Africa, which imposed its laws and, from 1948, its apartheid policy. Uprisings and demands by African leaders led the UN to assume direct responsibility over the territory. Namibia obtained full independence from South Africa in 1990, with the exception of Walvis Bayand the Penguin Islands, which remained under South African control until 1994. The star England allrounder - Kevin Peter Pietersen, was born in Pietermaritzburg, made his first-class debut for Natal in 1997 before moving to England. His English mother made him eligible to play for England and after serving a qualifying period of four years. So some history of India, South Africa, Namibia – all with a tinge of Cricket !